Lights… Camera… Action! It’s officially summer, which means it’s time for our Summer movie series list! Many theaters around the area are offering family movies throughout the season. Not only are the movies fun for the whole family, but the summer movie series is surprisingly affordable. Grab some popcorn and get ready to head to the movies! 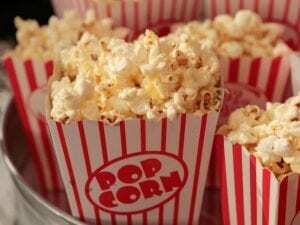 The Alabama Theatre is hosting family movies every Thursday in July. The box office will open at 9:00am the day of the show. No advance tickets will be available for purchase. Tickets are $5 for adults, $3 kids 12 and under and free for kids 2 and under. The Edge theatre in Crestwood will be showing a FREE movie every Tuesday, Wednesday and Thursday starting June 5th! The doors will open at 9:00am with the movie starting at 10:00am. There will also be a special kiddie meal available. Some of the movies that will be shown include The Secret Life of Pets, The Boss Baby and Trolls! For a full list of movies and dates check out the link here! 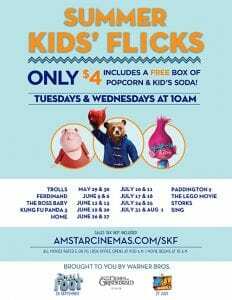 The AmStar Theater in Alabaster will be having it’s annual Summer Kids’ Flicks. The movies will be every Tuesday and Wednesday at 10:00am. The cost of each feature is only $4.00! Premiere Cinemas, located in McCalla, will be showing your kids favorite movies starting June 10! There is no pricing information as of yet, but we will update you when it becomes available. Veterans Park will be hosting Movies in the Park starting June 8! The showings will begin at dusk. Bring a blanket, chair and some snacks and enjoy a FREE night of fun with the whole family! Come to Veterans Park in Hoover on Fridays starting June 1st to enjoy family movies on a 40 foot screen! Drinks and snacks are welcome. All you need is a chair or blanket. A kids zone will also be available to children to play before the movie begins. The best part? It’s all FREE!